I had a plan for how to blog about this project, but I’m going to step out of order and talk about the latest development since it pertains to the last Fusion 360 Meetup. So to catch up in a hurry: I’ve already constructed a control box containing an Arduino Mega 2560 and a Raspberry Pi, power supplies, relays, etc. all mounted on DIN rails. This is the “brains” of the system, and the Pi runs an open source control framework called EPICS. The control box sits on a separate stand on wheels that I welded. In keeping with the “Beer Church” theme, I suppose this is the “Beer Pulpit”. I realized early on that the control box was out of room. I want this brewing system to be modular so that I can attach different equipment and reconfigure everything via software. To that end, each device needs to connect to the control box with its own sturdy, detachable connector. The original BrewTroller project (which isn’t online anymore) made use of XLR jacks. These are ideal. Nearly every device I’m interfacing with uses 3 or, in some cases, 2 wires. The OneWire serial bus, which is used for measuring temperatures, uses a 3 pin M12 connector; these are chained together using splitters. A few use cases need more than 3 wires: multiple pressure transducers on one board (used for fluid level sensors) and stepper motor drivers (used for controlling gas needle valves). For these, I’m using 8 pin mic connectors. But I don’t have enough panel space on the control box for all of these jacks, especially now that I’m considering adding a small touch screen. 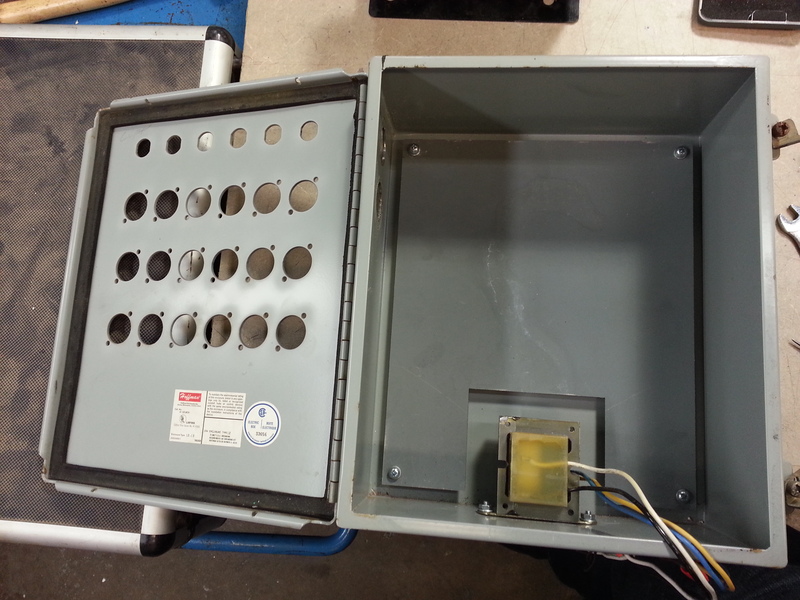 Nor do I have room inside the control box to mount a 120 V to 24 V transformer; 24 VAC is a HVAC standard, and the propane burner valves need it. A number of commercially available and hobbyist-built computer controlled brewing systems already exist that solve many of the issues I mentioned in my previous post on this topic. They have a number of similarities, but address the problems in different ways. I’m going to describe a number of methods used for computer controlled beer brewing, which improve up0n repeatability by reducing deviations in the mash process. These systems range from simple thermostat / standalone PID controls to microcontroller-based devices. I’ll also list my own design decisions when building this system and my reasoning. Note that my design decisions aren’t necessarily best, there are plenty of valid arguments for and against many of the solutions presented here, and as I write this, I’m kicking myself for some of the mistakes I made along the way. Brutus Ten – Website here. Build pages here and here. 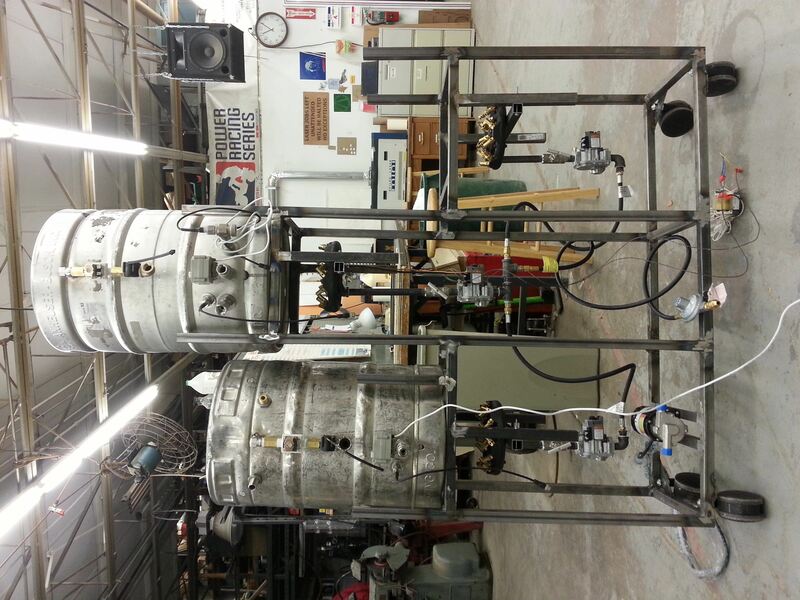 This is a popular brewing system due to plans published in Brew Your Own. 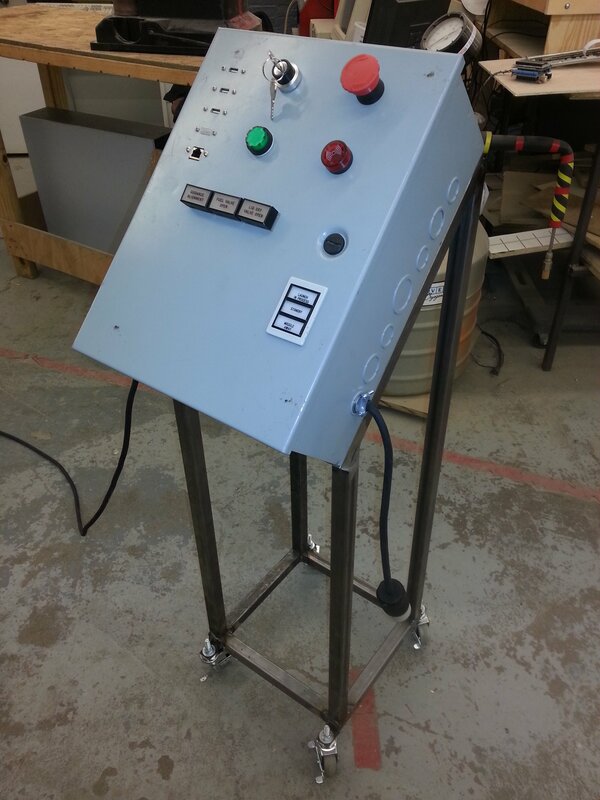 It consists of a welded steel frame and propane burners driven by standalone industrial temperature control modules. 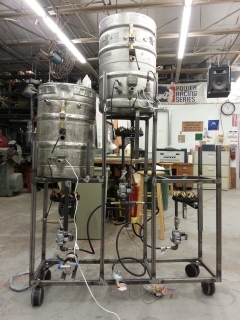 BrewTroller – The original website was oscsys.com which features an Arduino-based open software and control electronics framework for brewing. The website hosted the software, documentation, a web forum for users, and an online store where one could purchase electronics, actuated valves, switches, temperature probes, etc. It is not locked to any single brewing system design; rather, it is flexible enough to support a wide variety of brewing hardware configurations. While the original site shut down, a user took this over at this site. Scotland is a place that, for the average American, provokes strong reactions. Single malt Scotch whisky. Haggis. And bagpipes. 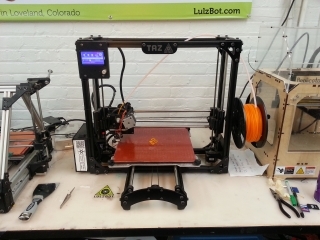 At least in America, the thought of 3D printed bagpipes may inspire fear in some people. Bagpipes were considered weapons of war, and commonly thought to be banned following the unsuccessful Jacobite Rising of 1745. (The Act of Proscription 1746 doesn’t directly mention them, though.) Personally, I’m quite a fan of pipe music, as well as other Scottish folk music, such as the Corries, and the music of Nova Scotia, especially Mary Jane Lamond. I bought a Highland bagpipe practice chanter years ago, only to discover that the angle I had to hold it to keep my fingers in the right position was torture on my wrists. I figure it would be more comfortable to play when attached to an actual bag. But acquiring a full set of Highland bagpipes wasn’t terribly practical, and that would probably lead to my neighbors breaking down my door and coming after me with torches and pitchforks should I try to practice indoors. Or at least they’d complain to the condo association. So I forgot about that for a while. Then in spring of 2014 I saw the Dreaming Pipes Kickstarter posted by Donald Lindsay of Glasgow. He was creating a 3D printed chanter with a customized extended range for the Scottish smallpipes, which are, as their name suggests, smaller, and designed to be played indoors. But he was also creating plans for a full set of smallpipes modeled off a 17th century design that could be 3D printed, with a laser cut bellows. And he was also designing 3D printed Highland bagpipe drones. I’ve got access to four 3D printers and a laser cutter at Pumping Station: One. It looked like fun to build. So I backed it. Liquid nitrogen (LN2) rocks. Yes, officially speaking, I need to get liquid nitrogen at PS:One so that we can do serious sciencey stuff, like, say, energy dispersive X-ray spectroscopy on the scanning electron microscope. But, unofficially? Driving nails into wood with a frozen banana, or making ice cream, is just plain awesome. And the clouds of chilled water vapor billowing out of flasks like something from a mad scientist’s lab… what can I say, I’m easily amused. First, we need a source to buy LN2. 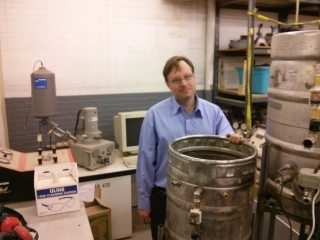 Fortunately, a very generous individual, who happens to own a really cool company that has helped us in the past with CO2 tanks and refills, and provided free LN2 to test the EDX detector on the scanning electron microscope, offered us a great deal for purchasing it. But transporting -321F liquid to PS:One and storing it presents unique challenges. So we need to start with a large storage dewar. These can be ridiculously expensive. I scoured eBay, found one, posted a crowdfunding request to the PS:One mailing list, and, thanks to the generosity of a bunch of donors, I made the purchase. 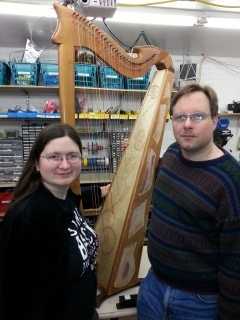 At long last, the CNC Steampunk Harp that Elizabeth and I have been building is, at least functionally, finished! In previous posts, I documented the process of routing pockets in the side of the harp using PS:One’s CNC router, and our road trip to Sector67 in Madison, WI to use their seriously awesome laser cutter. This completed the work on all wooden parts of the harp, and so I could finally assemble it. First, I had to glue the stiffener boards to the back of the sound board and used the drill press to make holes for the 33 strings. Gluing the sound board to the harp body required a lot of fast work: driving nails to hold the sound board in place, flipping it over and trying to wipe out the dripping glue while only having access to the inside via small holes, flipping it over to drive more nails, rinse, lather, repeat… all the while, the glue is starting to set. Then I glued the trim strips in place that covered all the nails. After that glue dried, I used a 1/4″ roundover bit on a router to clean up the sides of the sound box, and… oops! To my horror, I realized I forgot a step in the directions that said I was supposed to use extra nails to reinforce the area where the sound board joins the base near the pillar. 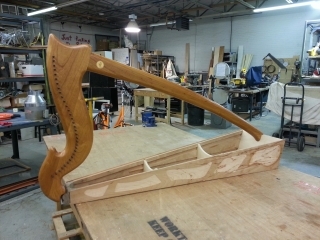 Seeing as the harp has over 1000 lbs tension on the sound board and I really don’t want it pulling itself apart, I used the pneumatic nailer to shoot brads through the lower front trim strip. Then I needed to use wood putty to cover the brads. Oh, and did I mention that the angle of the nail gun wasn’t quite right and the brads poked through the bottom? So I had to bend them over with a nail set and cover those holes as well with wood putty. You live, you learn…. The sound board of the harp had always been the wild card. Elizabeth and I began the project last year knowing that we’d want to use a laser cutter to etch it with some kind of Victorianesque steampunk design involving gears. And we knew that PS:One’s Epilog, with its 24″ x 12″ bed and no feedthrough capability, simply couldn’t fit a 49″ sound board. While design focused on the brass panels, as we did have access to a CNC router, the sound board was left for later, especially because we didn’t know if we could find a smaller laser cutter with feedthrough, meaning we needed a design that could be etched in pieces, or a large laser cutter that could engrave the entire sound board at once. Elizabeth and I were planning a trip to Madison, WI, and we heard rumors that Sector67 had a colossal Chinese import laser cutter. I reached out to them asking if they would be willing to help with this project, and Chris Meyer, director of Sector 67, responded, inviting us to their space. Knowing what we had to work with, Elizabeth was able to create the design in Adobe Illustrator. The brass panels would be etched using a galvanic etching process, similar to the one used by the Steampunk Workshop to create their clockwork guitar. Elizabeth would design the shape and custom artwork (gears, of course!) for this. The sound board would be laser engraved with some type of steampunk design. 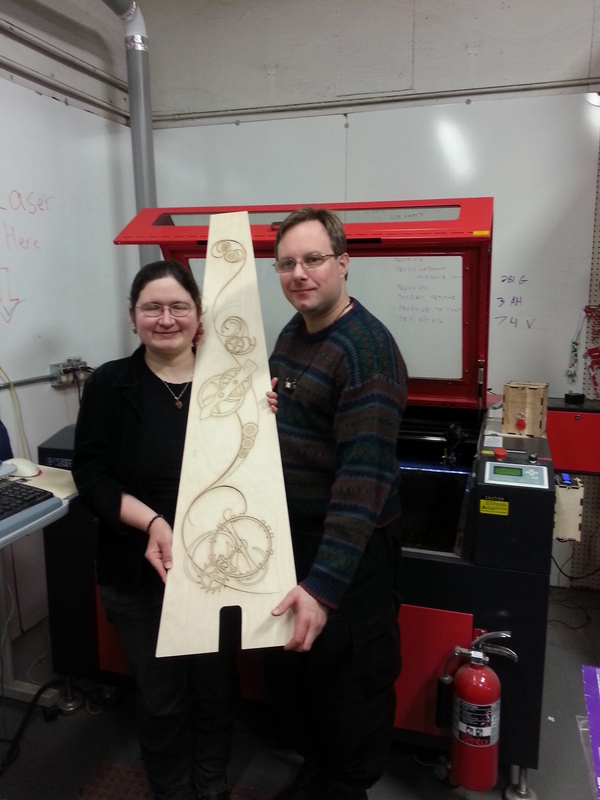 The design is in progress, and we are searching for a laser engraver large enough to handle the sound board. 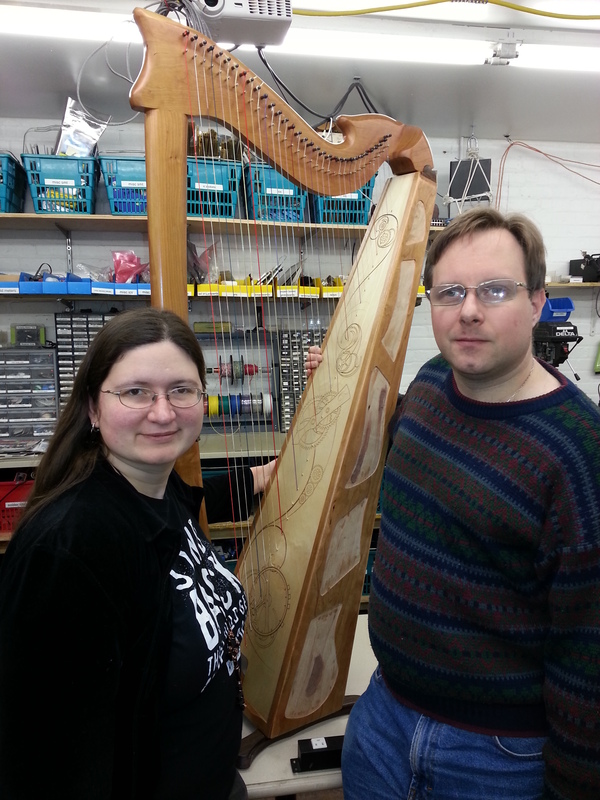 Although not strictly steampunk, I’d considered adding RGB addressable LED lighting under the neck of the harp, which could illuminate the strings, as well as respond to the pitch of the strings being played. 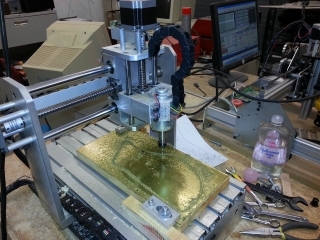 First, we had to start by routing the brass, using PS:One’s CNC 3020 router. Elizabeth drew the design, including the brass outline and the pattern we will use when we etch the brass. 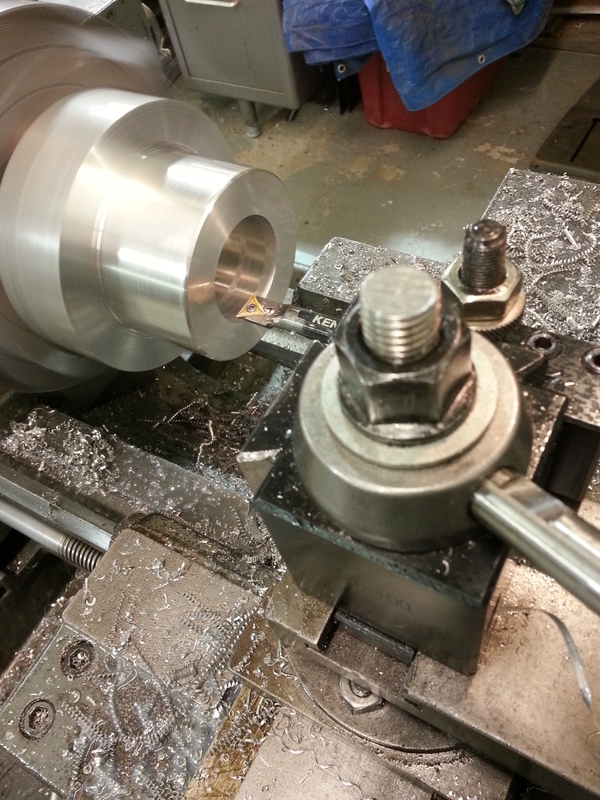 We did this last spring at PS:One, and we ran into massive problems with the brass vibrating and breaking end mills. The project remained dormant for many months until a breakthrough: What if we glued the brass to a scrap board? That would at least keep it immobile so it couldn’t chatter and bind on the end mill. The good news: This worked! Success! The bad news…. The Go To Home button on Mach3 does not, by default, raise the spindle before moving it. And a clamp was in the way. The result: A badly bent spindle. Well, all was not lost…. Back in October, Pumping Station: One hosted an event called Locktoberfest, an annual event run by the Chicago chapter of TOOOL (The Open Organisation Of Lockpickers.) It features, well, lockpicking, beer, and brats. (The beer is necessary to relax one’s hands. Really. I mean it.) A number of nationally known people came out to Chicago for this, including Deviant Ollam and Babak Javadi. Lock picking involves manipulating small components. 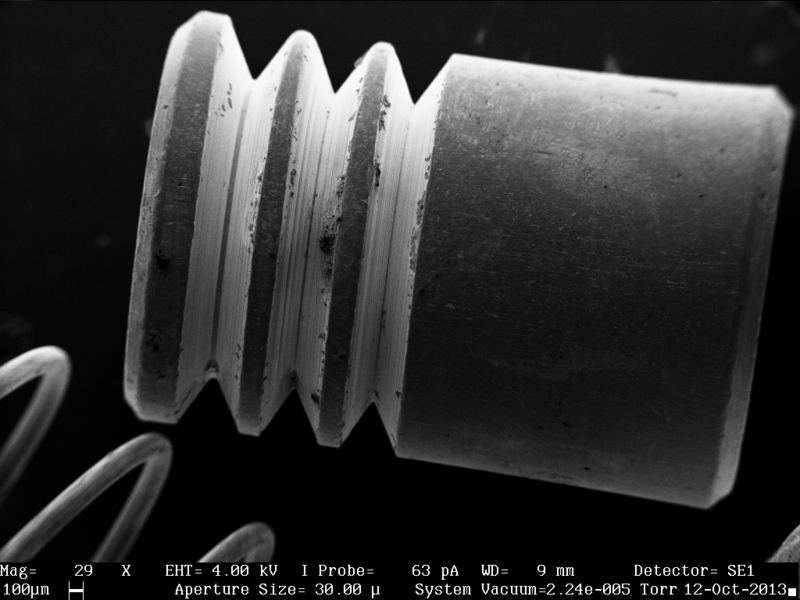 Small metal components, which are conductive, and would image well in a scanning electron microscope. And it just so happens that we’re probably the only hackerspace with a working SEM. PS:One’s scanning electron microscope came with an Oxford Isis EDX detector that we were told was non-functional. After a little poking around, I discovered that the replacement power supply which supposedly didn’t work was shipped from London, where the default power is 240V. After changing the voltage, the computer suddenly recognized the electronics, and it passed all the self tests. That looked like a good sign, so the next step was to acquire liquid nitrogen, which is needed to cool the detector. Fortunately, one of our members owns NFC, a company that, among other things, sells liquid nitrogen. 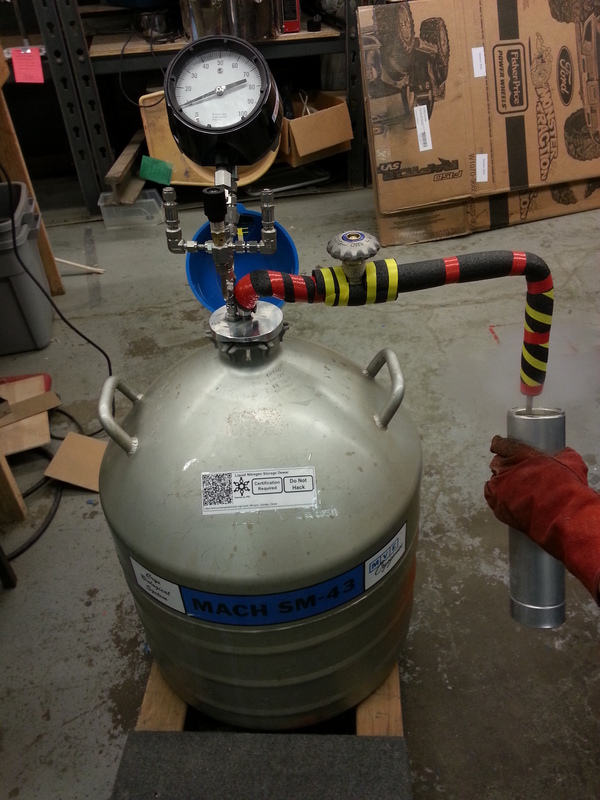 He loaned us a dewar of LN2 so we could test it out. After transporting it back to the space, I asked Everett to watch from a safe distance and let me know if anything was spilling while I filled the dewar attached to the SEM. He took some video of the process. The plastic funnel I used was cracking as I was pouring, which in hindsight wasn’t that great of an idea, so maybe we need to find another solution here….